Maybe you’ve heard it mentioned in conversation, or maybe you have it – either way TMJ certainly doesn’t stand for “Too Much Joy”! TMJ disorder, named for the temporomandibular joints it affects, is a condition that baffles even most dentists! How can one joint be responsible for so much pain? If you’re experiencing face pain, pain when you open and close your mouth, pain when you chew your food, or “popping” sounds when you open your mouth, you definitely need to call us and come in so the doctor can have a look! The temporomandibular joint is located on each side of the jaw, right in front of your ear. This joint, which moves whenever you chew, yawn, talk, open your mouth or even swallow, is the most complex joint in your body! Its ability to function correctly is based upon the integrated action of muscles, ligaments, nerves, discs, and the joints themselves. Proper diagnosis and treatment of TMJ may require evaluation and treatment by several different types of doctors, including the dentist, an ears, nose and throat doctor, a neuromuscular dentist and a primary care physician. Mouth Guards – Help to relieve pain by preventing you from grinding and clenching your teeth. Since you often do this when sleeping, you will probably be advised to wear the mouth guard to bed. Jaw Exercises – Designed to eliminate clenching and help relax the jaw to aid its realignment. Chiropractic Care – Many have found TMJ relief through this alternative non-invasive treatment method, that doesn’t rely on drugs or surgery. Lifestyle Changes – Since stress can be a factor in TMJ flare-ups, counseling, biofeedback, massage etc., may be helpful to relieve some of the stress that is aggravating the condition. Medicine – Muscle relaxers, anesthetics, and pain relievers may be prescribed, although the relief they bring is often temporary and only addresses symptoms, not causes of the TMJ. 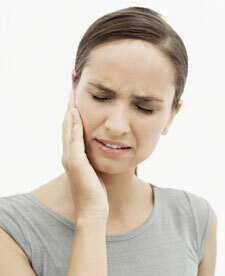 Living with the symptoms of TMJ can be difficult, especially if the pain is incessant. Often the pain will disappear on its own after some time has passed. And sometimes it goes away and comes back. Frustrating? Yes – both for you and the doctor. If you have any of the symptoms of TMJ and you’re not sure where to turn, start with a dental examination. If we can’t help you, we will certainly make referrals to other healthcare providers who might just be able to help you. Please don’t suffer needlessly in silence. Give is a call so we can help you through the pain!